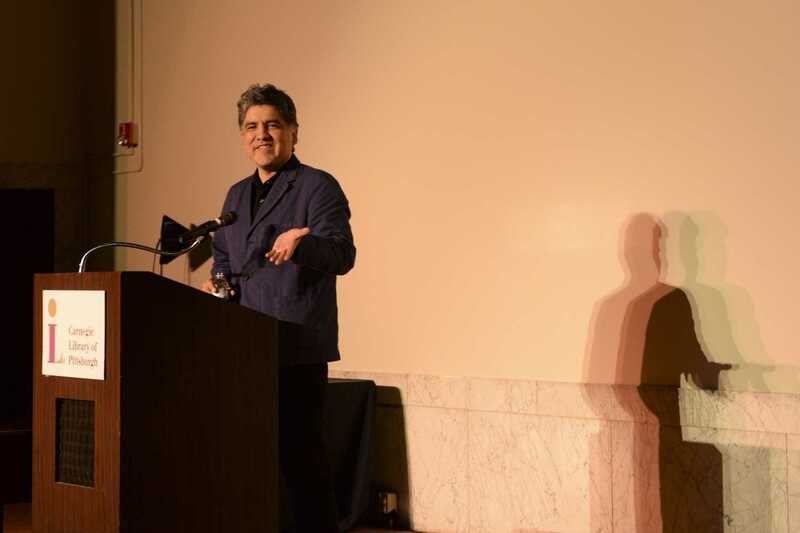 Sherman Alexie entertained an audience of fans Sunday as he talked about growing up with hydrocephalus, a condition where fluid builds up in the brain and swells the head. Alexie, a Native American author of 26 books, spoke to several hundred people Sunday afternoon at the Carnegie Library Lecture Hall as a part of the Carnegie Library and Pittsburgh Arts and Lectures’ Words & Pictures series. The event celebrated the 10th anniversary of Alexie’s first young adult novel, “The Absolutely True Diary of a Part-Time Indian,” which won the National Book Award in 2007. Fans of Alexie’s work were able to hear him illustrate his experiences growing up poor and sick on a Spokane tribe reservation, listen to his perspective on race and poverty and learn how that influenced his books — which are mostly semi-autobiographical. Alexie said he was not only part of a “tribe of hydrocephalics” but a “tribe of Indians,” talking about how his identity as a Native American influenced his perception on race relations. He expressed how “Native Americans are people too” and shouldn’t be set apart from other races just on the basis of skin color. Though he emphasized people’s similarities, Alexie also encouraged his audience to explore new ideas and take the time to meet people different from themselves rather than staying in the same environment. “We are constantly immigrating and emigrating,” he said. John Thomasom, a first-year majoring in engineering at Pitt, said this part of Alexie’s speech resonated with him since he felt the same way by leaving his home state of Tennessee to study at Pitt. “It’s always important to see different places and the different faces and ideas that come with them. From where I’m from there would never be a talk like this,” he said. Alexie also spoke about how his poor economic status inhibited him as a child, but it gave him an opportunity to survive and learn. “Being sick and poor is a deadly combination. But being a sick, poor, brown kid also has options. The U.S. government pays for his surgeries. It pays for his education,” he said. Alexie also recounted how becoming disillusioned with living on the reservation motivated him to leave and gain a better education. Kay Chase, a retired school psychologist, said she enjoyed Alexie’s lecture because of his spontaneous and lively rhetoric, which she also found in his novels. “He brings out the humanity in all people. He has a sense of humor that allows him to talk about dark and troubling things like social inequality, reservations and how he dealt with it,” she said. Jamilla Rice, who works in curriculum with Pittsburgh Public Schools and introduced Alexie at the lecture, said she really connected with the significance of literature on poor children. “I used to live on welfare and I had a single mother, but I always had books in my house. I got my first library card here at Carnegie Library. I was financially poor, but literacy rich,” she said. Like Rice, Alexie emphasized the importance of reading in his talk.